We have all become way too familiar with the private formulas for criminal greed. Such as: Lincoln Savings and Loan, Tyco, WorldCom, etc. The refined formula is shear genius in the GLOBALIZATION WEALTH REDISTRIBUTION CONSPIRACY. It brings the FED and central banks into the formula. 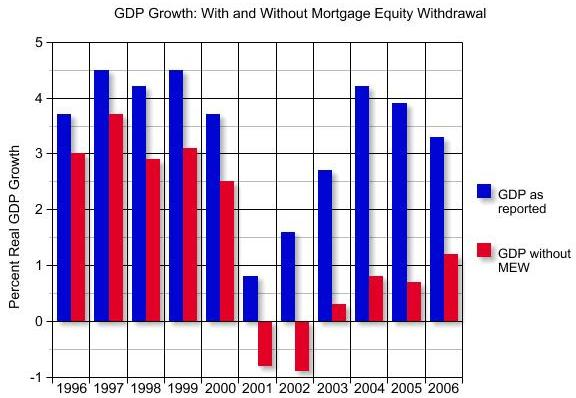 For the housing meltdown Bear Stearns, Federal Reserve, JPMorgan(E+F) x (MV+W) x (Y+Z) = X. This formula works as Earnings plus Fraud (criminal practices, cooked books, creative accounting) times the inflated Market Value plus W (W is Wall Street (insider info, Trader inside tipping) times Y (which is the collapse with conspirators getting out with golden parachutes) + Z (The "Z" Bankers, Federal Reserve, Government) = X? The X-Factor? Let's delve into the X factor, shall we? When Reagan and Bush were up to their ears in the recession and double digit interest rates left from the Carter administration, the fix was simple. Get government out of business. This is the ground floor of Republican economic ideology. Stimulate the economy yet keep regulation to absolute minimum. Allow competition to flourish, deregulate industry, keep bureaucracy to minimum and provide large tax breaks to corporations and wealthy to reinvest in existing and new business and let the economy trickle down to all. It was a good plan at the time and somewhat successful. The only drawback was the continuation of the national debt which was doubled during the twelve years even after he said it was our biggest problem during his campaign. Presidents as far back as Wilson were able to reduce the national debt to GDP percentages consistently until Reagan. Blame Reagan/Bush. Clinton came in with strong economy but a huge national debt which he reversed during his time, plus he left with a budget surplus. Great? No. Not great. Clinton passed the WTO China trade deal in 1999 as well as furthered the WTO, ITO and UN efforts to open the trade barriers which attracted the greed driven corporations to outsource manufacturing, IT, communications and call center services and he signed the Gramm-Leach-Bliley Act. Blame Bill Clinton.Let's blame Congress. It was they who passed Gramm-Leach-Bliley Act. The bills were introduced in the Senate by Phil Gramm (R-TX) and in the House of Representatives by James Leach (R-IA). The bills were passed by a 54-44 vote along party lines with Republican support in the Senate and by a 343-86 vote in the House of Representatives. Nov 4, 1999: After passing both the Senate and House the bill was moved to a conference committee to work out the differences between the Senate and House versions. The final bill resolving the differences was passed in the Senate 90-8-1 and in the House: 362-57-15. This veto proof legislation was signed into law by President Bill Clinton on November 12, 1999. It was the democrats who wanted changes in the bill to protect consumers [CRA]. What it really did was open the Fannie Mae and Freddie Mac free for all and encouraged the fraudulent predatory mortgage practices by giving loans to NINJA (no income, no job no assets) market and well you know the rest. The mortgagers, bank, hedge groups, Wall Street, rating agencies etc. all greedy and complicit. Along with the deregulation issues and the building of this gigantic house of cards, the government has allowed the merging of these large financial, banking and insurance companies. The monopoly factor aside, it created the inability to let said companies fail. At least that's what they inferred as they sold taxpayers the bailout. Were democrats more responsible for those? Yes, and we still don't see significant results. The point is that Greenspan and Clinton needed the housing sector to offset the trade agreements and the devastating effects that it would have on the US economy. They knew it and they were complicit in providing the two key ingredients, the money and the deregulation. The fact is that if Clinton and Greenspan had not created this housing surge the US would have had a negative GDP for three years after Clinton left office. This was the combined loss of jobs in the US over his term and the interest rates. George Bush was correct when he said he inherited a recession. He would have inherited a depression had it not been for housing market ponzi which would eventually be paid for by taxpayers. He just made matters worse with Iraq which furthered the strain on the budget deficits and national debt. He attempted the Reagan wealthy tax breaks and trickle down formula to stimulate with similar results. He gets credit for that but he did not manage the looming problem that I believe all of Congress and the FED knew was coming. These wealthy tax beneficiaries lost substantial assets as did the taxpayers. Any credible financial expert could have seen the enormous risk, uncertainty and warning signs of the sequence of these events. Literally, you can picture America's economy leaking out of every orifice. Why then do partisan politics throw blame around? The answer is to keep the American people from seeing the collective and colossal conspiracy by the government as a whole to redistribute the wealth from an IMF fiat based scam to an inevitable crash of currency and those who survive holding the limited hard assets. How can Americans still look to one of the two parties as not complicit in conspiracy? Does President Obama's economic rescue plan encourage you? I've read it. I just downloaded it in .txt and did a find for "$". What a miserable trip that was. I see another near trillion dollars of pork barrel going to places they shouldn't. If it's the housing market that got us here why are we not addressing it head on with all resources? Why is that not the battle cry for one party? Why don't we take the 800 billion dollars and give the 138 million taxpayers $6000.00 and take the toxic assets and break them into manageable mortgages and repackage them? How would the American people vote on that referendum? The truth can be said at this point. The collective body of government is a gelatinous heap of meaningless hubris molded, manipulated and managed by the corporate and banking interests with a single goal. "X"
Does "X" equal depression, bankruptcy, starvation, or worse? Or does X equal the American people standing up collectively without partisan baggage and political preference or tie and demanding this kind of referendum in lieu of revolution. I don't have to tell you what my solution is. X equals U.